Alright fictioneers, let’s add the ultimate science geek piece of equipment to your story—a telescope! In this chapter, Kaitlin has invited the cute chemist from the down the hall out for an evening of stargazing. She has a telescope and she knows how to use it. But do you? Here are a few fundamentals that you should understand before you write a telescope into your scene. This is the most basic thing one needs to know about the 2 main kinds of telescopes. In the old days, telescopes were straight tubes with a big lens at the far end and a small lens at the near end. These were called refractors. Today, beginner telescopes (the kind you buy for kids at science stores) are refractors. 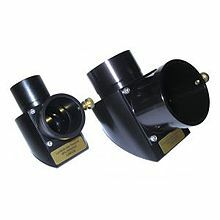 They work fine for seeing near-space objects, planets, the moon, and across land. To see more than that, a refractor would have to be very long and would quickly become heavy. Reflector telescopes use mirrors instead of lenses. Because the mirrors bounce the image around inside the scope, reflector telescopes don’t have to be long in order to see deeper space objects. Reflectors are used by most experienced backyard astronomers. All professional telescopes are reflectors. Here’s a thing that surprises most first-time telescope viewers: The image you see in a telescope is upside down and sometimes also reversed left to right. In other words, it is rotated 180 degrees. This doesn’t matter much if you are looking at stars or the moon, but for terrestrial viewing, well that’s a different story. Trees hang from the sky, animals walk on the ceiling, lakes appear to hover, and clouds lie in a pile at the bottom of your view. This means your characters cannot be looking at the stars one minute, and then next minute swing that scope around to look across the landscape. This 180 turn also has the effect of making the user move scope the wrong way to track things, especially when viewing the sky. Every time you move the scope to the right to get the star in the middle of your field of view, the star disappears off the right-hand side. It’s maddening. So, you ask, does that mean all those bird-watchers with the big scopes are watching things upside down and tracking birds backwards? No it does not. Most of them are using spotting scopes, which are less powerful but deliver an upright image. Or, if they are using a real astronomy telescope, they have spent the money for a special converting prism (sometimes called a “diagonal”) which gets screwed onto the eyepiece and flips the image for them. Astronomers don’t use diagonals because the extra lens takes away from the resolution of the image. Telescopes are not about “power” and “seeing far.” That is the language of binoculars. Telescopes are about letting in more light so that things that are very dim (such as distant stars and galaxies) appear brighter. The more light your scope lets in, the more sparkly space objects you can see. To get more light, you need a bigger diameter telescope – that is, a larger aperture. When amateur astronomers talk about their scopes, they refer to aperture in inches (or millimeters). An entry-level scope will be 3-4” in diameter. They go up from there. In professional astronomy telescopes are measured in feet and meters. For instance, the W.M. Keck observatory on Mauna Kea in Hawaii has an aperture of 33 feet (10 meters). That said, there does exist magnification in telescopes. Magnifying lenses can be added to the eyepiece of a telescope. To a certain degree they work, making sky objects appear larger. But more is not better. After a certain limit, the image, while larger, is too blurry to see. The maximum useful magnification is 50 times the telescope’s aperture in inches. Under that rule the top power of a 2.4″ is 120x, of a 4″, 200x. Beyond those limits images break down into dim, fuzzy blurs. Looking into the night sky with a telescope really means looking back in time. This is because light travels at light speed, meaning, while very fast, it takes time to get here. The sun is 8 light-minutes away. That means it takes 8 minutes for the light of the sun to reach your eyes. And that means you are seeing the sun as it was 8 minutes ago. But deeper space objects are much farther away. Aside from the sun, the closest star to us is Proxima Centauri. It is 4.2 light years away, so you would be seeing it as it was 4.2 years ago. The Hubble Space Telescope is able to see more than 14 billion years into the past, all the way back to infant galaxies. All of that probably seems a bit arcane for your novel. You just wanted Kaitlin and Derek (he’s the chemist, remember?) to go out and have a good time and maybe get to know each other a little better. Well, let me just say this—setting up a telescope in an empty field, looking at the stars, and talking about the awe of seeing billions of years into the past—well that’s a damn fine romantic night in my book. Another thing that surprises people who have never looked through a telescope is this: The sky is moving all the time. Ok, not the sky – we are. But either way, you can’t just set up your scope pointing at, say, the star Arcturus, and leave it there. Within just a few minutes the star will drift out of view. It happens faster than you think. 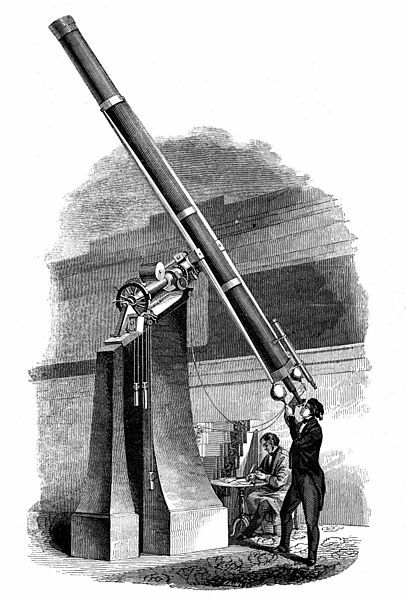 Many of today’s amateur telescopes have a computer on board. The computer does two things. It stores a whole database of sky objects and their locations (based on your location and time & date) and it controls a motor that slews (moves) the telescope. Using a remote control, you just tell the telescope computer “GOTO Artcurus” and it finds the object then slowly tracks it while you are observing it. Amateur astronomy requires more than just grabbing the scope and dashing out to the field. First of all, telescopes are heavy! My 8-inch Meade LX200, including tripod and case, weighs in at almost 100 lbs. And that doesn’t count the portable battery pack, extension cables, and box of eye pieces and lenses. Some people carry more ..
And, if Kaitlin is smart, she will also pack chairs, picnic blanket, bug repellent, warm clothes, cheese and crackers, and a bottle of wine. Some things are just essential. PreviousThose Crafty Corvids: What will they think of next? NextFrom Blogger to Book Author: How do you do that?